Ji Hyun Woo‘s military enlistment date has officially been set. The actor will enter the army August 7 and begin to receive basic training. Fortunately, he won’t be leaving without saying goodbye to his fans first through a fan meeting that will be held July 22. I have translated Ji Hyun Woo’s recent cyworld message in which he talks about saying goodbye to his 20s, as he will be in his 30s when he comes out of the army in two years. Coming back to normal life…I’ve been living a warm and cozy life. My 20s…When I look back at it now, I’ve lived it to the fullest. almost to the point of being foolish. Truthfully, there were things that I didn’t want to do. the charm of the 20s is having to do the things that you don’t want to do and enduring them. You have to have done things you didn’t want to do in order to understand what “good” means when you do something that is good. I am happy to have met those of you who are reading this. I am truly thankful…I will repay that gratefulness. I thought about what I could do for you while I am in my 20s. So after much thought, I will hold a small concert. I’ll be holding a concert for the last time in my 20s. I’m so glad that I watched Queen In-Hyun’s Man and got to know the actor Ji Hyun Woo a little more. I’m also happy that it was his last project before he entered the army. The happy experience of the drama will stay with him while he is the military and will also be a good memory for fans as we wait for him to return. Lucky fans will get to see his concert. Sad for those who don’t live in SK. He seem like a genuine down to earth kind of guy. Wish him and YIN the best. Thanks for the update Jooni. It is only after watching QHIM that I grew to appreciate him as an actor more as his previous roles were just not befitting him, especially that Drama That Must Not Be Named. He certainly gave a fantastic departure by leaving behind this gem of a drama. I am so glad he found his soulmate in In Na, and was not afraid of letting the world know, and not afraid of the outcome. I hope that their relationship is able to withstand the absence. He is an inspiration to everyone on how to be totally honest with your feels. Thank you Joonni for this update. I am very grateful. I hope I can watch Yoo In Na dramas after his departure to remind me of him in Yoo In Na…. Am I crazy?.. All the best to him and will wait for his next project. All the best to you too. July 7th… must prepare a box of tissue… Huhuhuhu This is the first time when my favorite actor’s going to the army…. 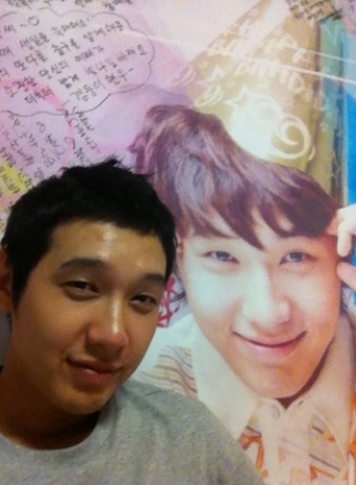 Joonni, thanks for always keeping us current on our Ji Hyun Woo. This man seems so wise beyond his twenty plus years. He just keeps on impressing with his honesty and straight forwardness. You will be in our thoughts and prayers. May time go by quickly and you return to YIN and your fans. Day before my birthday! If anyone goes, wave for me! I will wear black arm band as he departs. Did not get a chance to do for LJK who is now back but will for him! Aug 7th will be a sad day! Hope him and YIN continue their relationship. If it makes it through to 2014, its gold! LOL, a black arm band. Ahhhh! Thanks for this update. I agree with all the nice words you said about him. I guess we can just rewatch some of his videos on 7/22 and imagine we are at his concert…. He will also be my first person that I actually will MISS while he serves. I guess because I just met him, and want to see him be happy with YIN. I wish I can attend his mini concert….gonna miss him bad….i wish their relationship grows stronger in time…. do you know what should I do if I want to go to his farewell party? Hi Hipp, sorry to say this, the application for his farewell party has been closed on this Monday…. Hey Jooni! He just posted 2 new messages on his Twitter plus some phone text message pictures. We’re going crazy at Soompi because no one is around. (LOL) I hope you get this message! LOL. Got your message and posted the translations on JHW and Inhyun Soompi thread.